The final box score has the No. 20 Florida Gators beating the Kentucky Wildcats 28-27 at Kroger Field in Lexington, Kentucky, on Saturday night. The final result is the extension of a decades-long streak and a victory for a road team favored in a Southeastern Conference league game. And while every win or loss includes its share of unique conclusions to draw from its outcome, this one in particular was rife with them. Streak extended: Look, there’s something to be said for the Gators getting the job done in the end. They have now won 31 straight games against the Wildcats and are 51-17 in the series (29-4 in Lexington) all-time. It was also the fourth come-from-behind fourth-quarter victory by UF over UK since 1993. Playmakers found: There is plenty to be concerned about in all three phases, but it must be pointed out that Florida has a better compliment of playmakers than it has in years. Freshman Kadarius Toney stood out like a true video-game creation with a 36-yard rushing touchdown, 35 yards receiving on four catches and a 50-yard pass to sophomore wide receiver Tyrie Cleveland, who posted 110 yards and a touchdown (on a different play) on the evening. Freshman running back Malik Davis, who all season has appeared to be the most explosive player at that position, finally got ridden by the coaching staff to the tune of 93 yards on 21 carries, many of them hard-fought and most of them clutch late in the fourth quarter. And even though Brandon Powell is a redshirt senior who did not put up gaudy numbers, he made a big catch and some tough runs, and he also took a couple direct snaps while scoring a touchdown on Saturday. Whether the Gators get junior playmakers Antonio Callaway and Jordan Scarlett back or not, that group of players is something legitimate to build on offensively for the duration of the season. Playcalling improved: Fans may be frustrated with what they see as a lack of imagination offensively, but it’s tough to say Florida did not open the playbook on Saturday night. 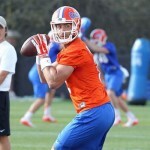 While it may not have always been effective, offensive coordinator Doug Nussmeier employed direct snaps, wide receiver passes and more wrinkles than we’ve seen from UF in quite some time. It is also clear that a more experienced quarterback has proven to be better at reading progressions and hitting receivers who are often open and missed by a younger signal caller. But yes, fewer second- and third-and-long runs would be a nice surprise. Johnny Football: The importance of redshirt senior punter Johnny Townsend is never underestimated, but it still needs to be noted. Townsend punted five times for 261 yards on Saturday with an average of 52.2 yards, a long of 61, three punts of 50+ yards and one downed expertly inside the 10. Some of hits punts were wasted by Florida, as is typical of late, but that does not make his contributions any less important. There was blocking: One week after UF’s running backs looked completely incapable — or unwilling — to block and the offensive line once again looked poor, Florida either figured things out or responded to a tongue-lashing by the coaching staff. Redshirt senior RB Mark Thompson made a couple key blocks in the game and was obviously putting forth better effort in pass protection; he also as a clutch 11-yard run late in the game. The offensive line as a whole dominated Kentucky down the stretch on UF’s final 5:48 drive and also provided a relatively clean pocket for the quarterbacks in the second half. Quarterback controversy returns: Though redshirt freshman Feleipe Franks was not exactly bad completing 7-of-12 passes for 85 yards and a touchdown, it was apparent Saturday that he is not the best quarterback to lead the Gators this season. And the reason is very simple. Franks locks onto his primary option on passing plays and rarely deviates, often not even seeing open receivers. There is nothing wrong with wanting Franks to be the guy, but there’s also nothing wrong with recognizing he’s not there yet. Redshirt junior Luke Del Rio may not have the athletic gifts of Franks — and he did throw an interception moments after replacing the youngster in the third quarter — but he was clearly more capable of leading the offense and making strong decisions. Del Rio finished 9-of-14 passing for 74 yards and a touchdown, but he went 5-for-6 on the final drive, led the Gators to 14 unanswered points and was much more successful on third (and fourth) down. There’s a chance Florida puts Franks back in as starter against Vanderbilt, but I would bet you will see Del Rio in every game the rest of the way this season. Penalty problems: Already thin in the middle, the Gators lost sophomore linebacker Vosean Joseph to targeting and somehow lost 30 yards for two personal fouls despite only Joseph being singled out. But I digress. Florida committed eight penalties for 72 yards in the game, including a 15-yard roughing the passer on Kentucky’s final series of the game that put it in field goal position (until a UK holding penalty ruined that spot). UF also gifted the hosts three first downs due to penalties, continuing drives that would have otherwise ended. Defense is a major issue: Inside the bad, let’s start with the good. The Gators held the Wildcats to 1-of-10 on third down. OK, back to the bad. Kentucky didn’t need to convert third downs most of the game because it was gaining insane amounts of chunk yardage on first and second. UK had five pass plays of 21+ yards, and quarterback Stephen Johnson threw three touchdowns in the game. Florida seemingly misses a handful of tackles on every drive and has some players — like sophomore safety Chauncey Gardner — who are truly struggling to wrap up their opponents. The defensive line does not set the edge consistently. The linebackers over-pursue. The Gators locked things down in the fourth quarter on Saturday, but they were relatively awful defensively the rest of the game. This is not simply a “not-as-great-as-usual” Florida defense. It is a bad one. And that’s not going to change overnight. 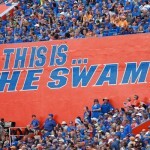 There are some talented pieces, but the Gators’ atrocious defensive recruiting under head coach Jim McElwain, coupled with losing so many defenders to graduation and the NFL Draft over the last two seasons, has this unit floundering. Non-kicking special teams: Townsend is great, and redshirt junior kicker Eddy Pineiro is very good even though he surprisingly was not needed on Saturday night. The rest of Florida’s special teams are abhorrent. And that’s being nice. The Gators gave up 87 punt return yards on Saturday, an average of 29 per returnable ball, sometimes completely negating the brilliance of Townsend, arguably the best punter in the nation. Florida is totally undisciplined in that phase of the game, and even fugazi versions of game-changing gunners like Matt Elam, Loucheiz Purifoy and Chris Thompson are nowhere to be found on either punts or kickoffs. The Gators also get absolutely nothing in their return games as no one blocks for the returners and provides any opportunity to break a run. Special teams coverage and returning, which used to be a tenant of successful Florida teams, is now a massive problem. Special teams coordinator Greg Nord, who has been with head coach Jim McElwain since the beginning, should be feeling some massive heat — yes, way more than Nussmeier. 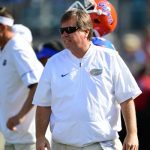 Blown coverages by Kentucky: The Gators found some offense on Saturday, but the Wildcats were immensely helpful in allowing that to happen. Kentucky blew coverage — and by “blew coverage,” I mean left wide receivers wide open without defenders — not once but twice in the game, and each of those miscues led to Florida touchdowns. Would UF have scored anyway on those possessions? That is very possible, but it should never been that easy for any team to put the ball in the end zone. Credit to Franks and Del Rio for both making tremendous heads-up decisions to quickly snap the ball and take advantage of the coverage holes with immediate throws, but they should never have been given that opportunity. For whatever positive things the Gators did, they have to admit that the Wildcats handed it to them on a silver platter. What a comeback, wasn’t sure the Gators had it in ’em, but they held on. On the other hand, did somebody misinform the defense that this was a touch football game? Watching UK fans get their hopes crushed every single year in the silver lining, however, this is a piss poor coaching staff and probably one of the most mediocre (from a talent perspective) gator teams I’ve seen in many years. You nailed it, McElwain’s defensive recruiting has been straight up pathetic, and now the gator nation is paying for it. And wow that OL is terrible. Adam, I agree the defense, special teams coverage, coaching and time management were on display and very much exposed for everybody to see. BUT we won the game! Hopefully we can improve and correct some things before we play a better team. In all kinds of weather! I know we are not where we would like to be as a team at the moment , but Coach Mac has been in SEC Champ game in his first 2 years and seems to win close games. Everybody needs to give the guy a little credit! His Gators / guys keep competing until the end! Go Gators! Any news on the fight Lewis got into after the game? Is it going to effect his plays?